For several posts now, I’ve talked about neurons and how they talk to each other. I described what a neuron is and the various parts, the action potentials that are triggered when you need to use your brain, and the neurotransmitters that are the words neurons use to talk to each other. Now it’s time to end that story with the synapse itself. The synapse is the space between the axons of one neuron and the dendrites of a second neuron. There are thousands of synapses on every neuron. Synapses are tiny. 1000 of them lined up in a row would be about as long as the head of a pin! Synapses are like neuron phones, or neuron mouths. They’re how neurons talk to each other. Have you ever heard the saying, “no man is an island”? It means that each person needs other people in their lives. No person can succeed all by themselves. Neurons are the same way. No neuron acts alone. Nothing in the brain happens because just one neuron fires. For anything to get done, lots of neurons have to talk to each other. Remember, 1000 of these things can fit on the head of a pin. You’re looking at a tiny section of the axon and the dendrite, and the space between them, which is the synaptic junction. See the red and blue things? Those are ion channels. The red ones open when they sense a change in electrical voltage. I’ll talk about the blue ones later. The green circles are neurotransmitter vesicles. These are packages full of neurotransmitter. In the picture, the neurotransmitters are yellow stars. A lot of what I’m going to talk about is similar to the electrical stuff from the action potential post. Specifically, ion channels, and how positive ions like to move into the negatively charged neuron. At the synapse, the positive ion is calcium (Ca2+). You can imagine the synapse and the synaptic junction as swimming in a soup of calcium ions. When I left off, our action potential was charging towards the end of the axon at the speed of a racecar. What happens when it hits the end of an axon? 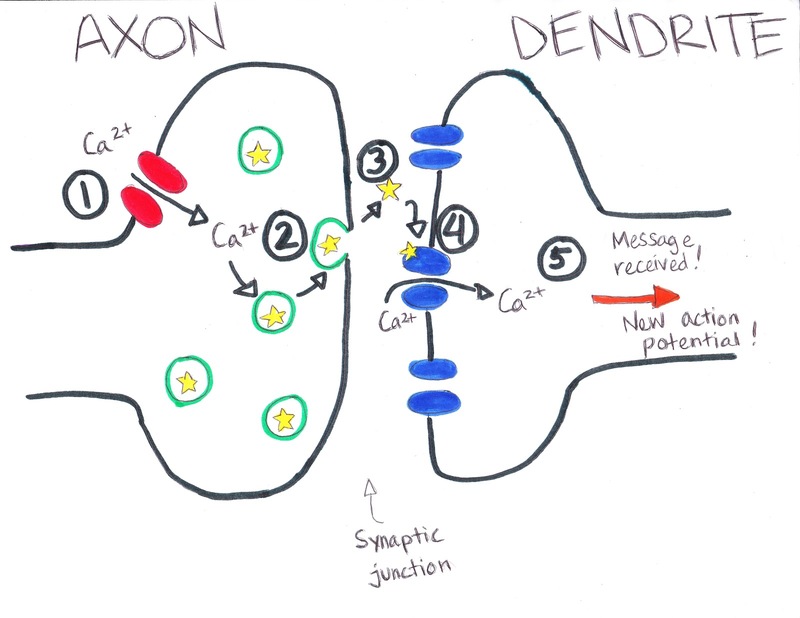 The electrical current of the action potential causes voltage-gated ion channels to open, and calcium flows into the axon. The vesicles “sense” the increase in calcium, and they know an action potential has just happened. They fuse to the membrane of the axon. (The membrane is like the axon’s skin.) The vesicles open up. Neurotransmitter flows out of the vesicles and into the synaptic junction. Neurotransmitter binds to the receptors. These are the blue things in the picture. 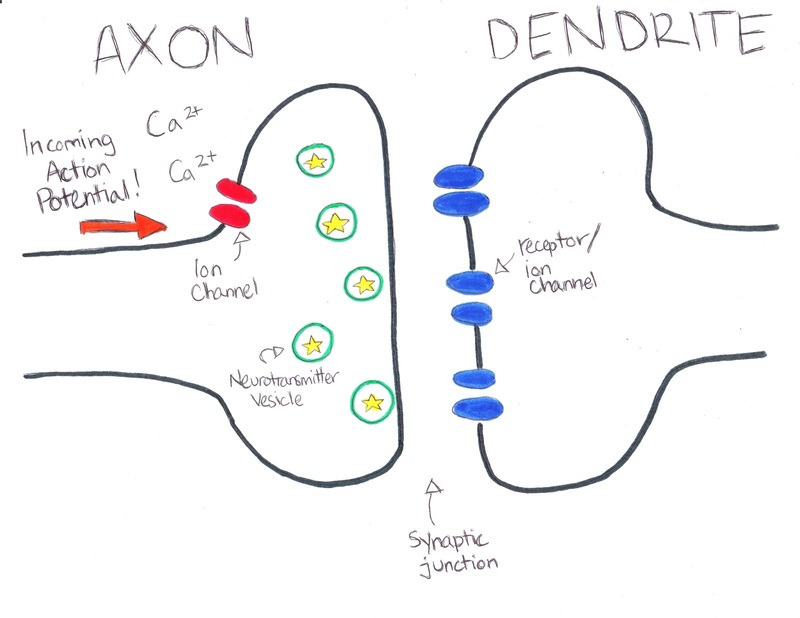 Receptors are ion channels. 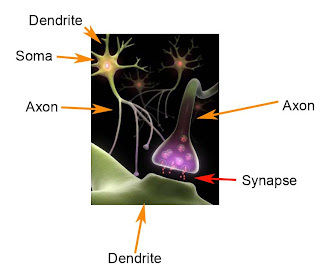 Neurotransmitter makes them open, letting calcium, sodium, and other positively charged ions into the dendrite. The inside of the neuron becomes positively charged. If you remember your action potentials, you know that when the neuron becomes positively charged, it sets off a huge racing electrical current. So what do you think happens when the neurotransmitter opens the receptor channels? Yep. Of course you got it. Now the message travels down the second neuron, and eventually to a third and fourth and maybe a hundredth or a thousandth neuron, until your muscles twitch or the lightbulb goes off in your head and you suddenly understand what your teacher was talking about. It takes a lot of receptors opening to start up an action potential in the second neuron. Sometimes it doesn’t happen at all, which is why you don’t notice a lot of what goes on around you, especially when you aren’t paying attention. The neuron can change the number of receptors on a synapse. In this way, some synapses become stronger, and more likely to trigger an action potential. That’s called learning, and if I’m doing my job, it’s happening in your brain right now. How? Well, that’s a subject for another post! Thank you for such a clear explaination!